Digital audio broadcasting (DAB) is a digital radio technology for broadcasting radio stations, used in several countries across Europe and Asia Pacific. In many countries it is expected that DAB will gradually replace FM radio. 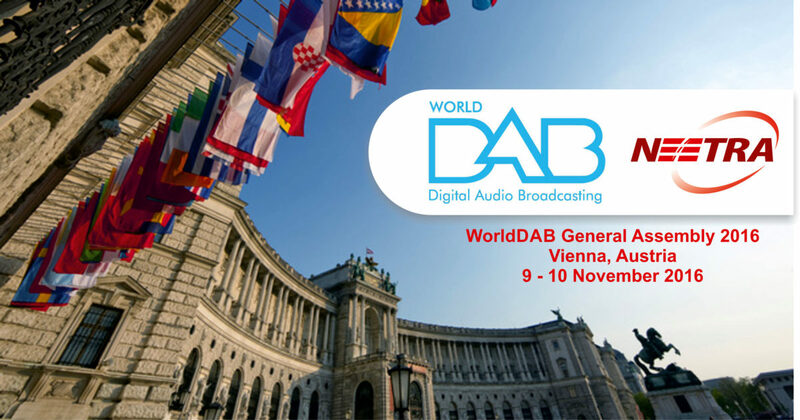 The WorldDAB General Assembly 2016 will bring together an audience of over 200 radio experts including policy makers, broadcasters and industry representatives to discuss the future of digital radio. The dominant theme of this year’s event will be the growing momentum towards the rollout of DAB across Europe and beyond. The General Assembly will be held at Hotel Savoyen Vienna, which was once home to the imperial Austrian state and court print works. The dinner provides an opportunity for event attendees to meet and network in a relaxed and informal environment. The WorldDAB General Assembly provides an ideal opportunity to communicate with a target audience and reach key decision makers. A range of tailor-made sponsorship and exhibition packages have been designed specifically for you to optimise your company’s exposure to a target audience.